Should You Worry If Your Horse Has A Runny Nose? My horse has a runny nose, a usual question I see on horse forums every day. Nasal discharge is not always a sign of trouble in horses. A horse can have a temporary allergic reaction to something in the air just as a human can. The key to knowing whether or not you should be worried lies in being able to distinguish between different sorts of nasal discharge. In this article, we discuss the differences and provide good advice to help you determine whether your horse’s runny nose is a cause for concern about your horse’s health. Read on to learn more. 1 Why Are There So Many Variables? 3 How Can You Determine The Cause Of Nasal Discharge? 4 Why Do Horses Get Runny Noses? 5 How Does Testing Help? 6 How Is An Equine Runny Nose Treated? 7 My Horse Has A Runny Nose. Must You Always Call The Vet? Why Are There So Many Variables? The anatomy of a horse’s skull is complex and puzzling. The system is labyrinth-like and provides lots of potential for the spread of infection from one part to another. Horses have several sinus cavities. The main ones are the frontal and the maxillary cavities, but there are several smaller ones, as well. The main sinus is connected to the nasal passages. To complicate matters more, the upper molar teeth in the back of the mouth also connect with the sinuses. Talking about a runny nose can be unpleasant, but knowing a few professional terms can help you have a descriptive discussion with your vet, without sounding like a grossed-out eighth grade girl (even if that’s what you happen to be!) Here are some terms you can use to describe the quality of your horse’s nasal discharge and to understand your vet‘s description of the problem. A “serous” discharge is thin and watery. A “purulent” discharge is thick and greenish/yellow. A “mucoid” discharge is just yellow. A “sanguineous” discharge is bloody. If both nostrils are runny, the discharge is bilateral, but a one-nostril discharge would be unilateral. How Can You Determine The Cause Of Nasal Discharge? Are there any new equines in the barn or in a neighboring pasture? Has my horse participated in a show, rodeo or trail ride recently? Are both nostrils runny or only one? What is my horse’s temperature? Is the discharge thick or thin? How is my horse’s appetite? Knowing these things will help you and your vet figure out what’s going on with your horse’s runny nose. Why Do Horses Get Runny Noses? 1. Virus: If your horse has a thick, purulent, bilateral discharge, the problem may be a viral infection. Even though viruses typically run their course, you should call your vet because the problem could spread to your horse’s lungs and cause serious complications. 2. Bacteria: If your horse has a thick, mucoid, bilateral discharge, he may have a bacterial infection. Also look for lethargy, cough and fever. 3. Sinuses: Thick, bad-smelling mucoid discharge, laterally or bilaterally can indicate a sinus infection. 4. Allergies: Clear, bilateral, serous discharge may be a result of dust irritation or allergies. 5. Hematoma: Sanguineous lateral discharge may indicate a serious problem known as progressive ethmoid hematoma. 6. Other problems that may cause a runny nose in horses include strangles (equine distemper) and guttural pouch infection, which would both cause bilateral discharge. 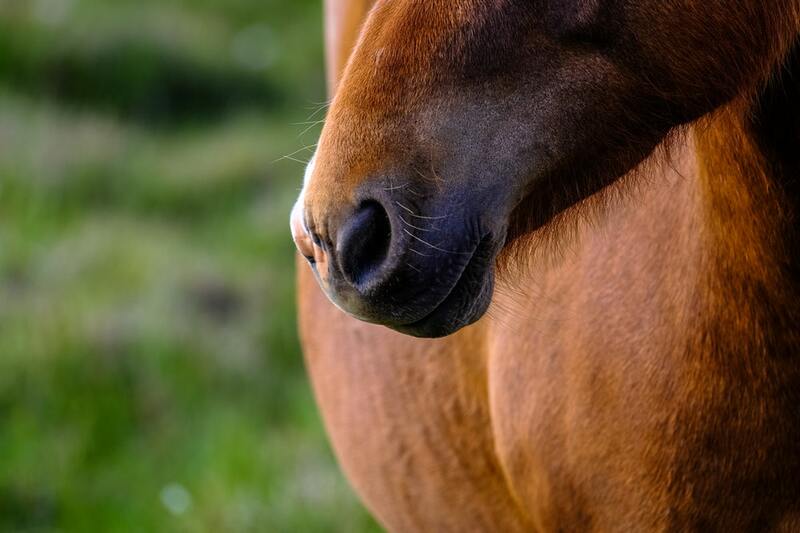 A horse’s nose drains bilaterally when the mucus comes from an area that is near the opening of the nasal passages. 7. Tooth and gum infections may also cause a runny nose. When this is the cause of the problem the discharge is typically unilateral and foul smelling. Knowing these things can give you a general idea of what your horse’s problem may be, but the only way to know for certain is to call in your vet and have some testing done. Your vet may want to do some blood work, take cultures of the mucus and perhaps perform an endoscopy or x-ray. Endoscopy allows your vet to peer into your horse’s head. An endoscope consists of a very thin tube with a tiny camera attached to the end. Your vet can insert this into your horse’s nose to see the inside of your horse’s nasal passages, sinuses, guttural pouches and trachea. Doing this helps your vet pinpoint the source of the mucus. Taking an x-ray can give your vet a clear picture of the extent of the fluid-fill in the guttural pouches or the sinuses. When guttural pouch infection is left untreated, mucus can harden leaving hard deposits called chondroids. An x-ray can locate these and can also help your vet find problems such as worn out, broken or cracked teeth or abscesses. Blood tests can help your vet identify strangles and confirm other types of infection. Blood testing is also useful for identifying the presence of fibrinogen in the blood and for getting an accurate white blood count. Taking a culture of the mucus allows your vet to identify bacteria that may be causing your horse’s problem. How Is An Equine Runny Nose Treated? Treatment depends upon cause. 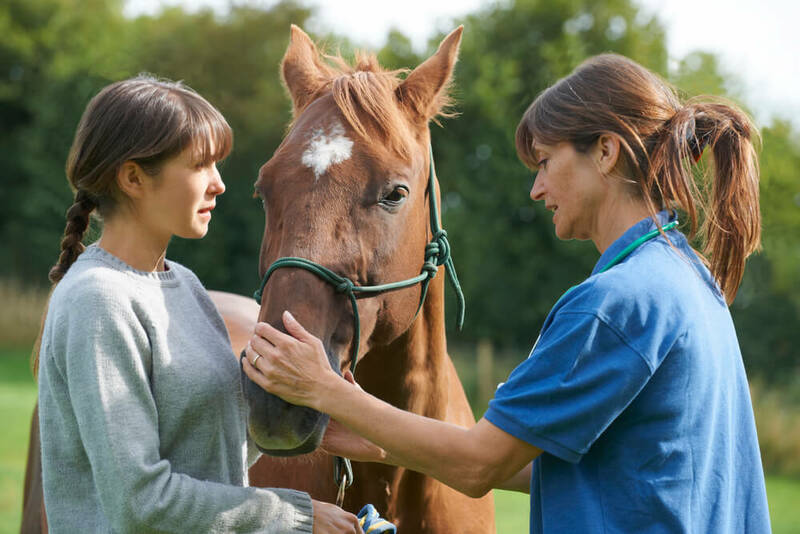 If your horse tests positive for strangles, the vet may recommend allowing the virus to run its course, unless your horse is in great distress. In this case, your vet may prescribe antibiotics. If your horse has a sinus infection or a guttural pouch infection, the vet may want to flush the pouches and/or sinuses to clean them and then follow up with long term antibiotic treatment. Problems with the roots of the teeth may also be treated by flushing the sinuses, prescribing antibiotics and directly treating the affected tooth. Very severe tooth, sinus or guttural pouch infection may need surgical treatment. My Horse Has A Runny Nose. Must You Always Call The Vet? If your horse just has a clear, odorless nasal discharge and no other symptoms for a few hours or even a day or two, it may just be due to dust irritation or allergies. If this problem clears up on its own, there is no need to call the vet. Any thick, yellow or greenish discharge indicates infection and is cause for concern. This is especially true if your horse is exhibiting other symptoms, such as lethargy or loss of appetite. If this is the case, call your vet right away and get a course of treatment started. Working together, you and your vet will soon have your horse breathing easy like the flute-playing horse in this video!